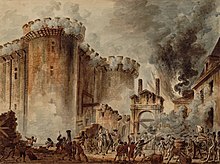 Prise de la Bastille le Jean-Pierre Houël (1735–1813). B' e dùn ann am Paris a bha anns a' Bhastille, gu oifigeil Bastille Saint-Antoine. Chaidh a thogail le Charles V ann an 1369 is bha e na phrìosain airson prìosanach poileataigeach. Thugadh ionnsaigh air 14 an t-Iuchar 1789. ↑ “Bastille key found”, BBC News. 2na dhen Iuchar 1999. Air a thogail 14mh dhen Iuchar 2018. Air a tharraing à "https://gd.wikipedia.org/w/index.php?title=Bastille&oldid=542922"
Chaidh an duilleag seo a dheasachadh 14 dhen Iuchar 2018 aig 07:05 turas mu dheireadh.